In conjunction with French composites manufacturer Resoltech, adventurer Sébastien Roubinet developed a boat that can sail on ice. An earlier prototype is shown here in trials traversing the Northwest Passage in 2013. The number of records for exploring our water-covered planet is limited only by one’s wild imagination…first to sail solo nonstop around the world, first to do the deed the “wrong way,” first to row across an ocean, and now, first to sail to the North Pole. It has been 109 years since Robert Peary, accompanied by Matthew Henson and four Inuit women, claimed to have reached the celebrated point (the wobbling of Earth’s axis makes a precise fix uncertain), or was it Frederick Cook a year earlier? No matter; neither employed a sail. 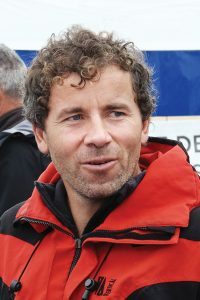 In his quest to sail to the North Pole, Roubinet has built a succession of boats designed and engineered specifically for this challenge. 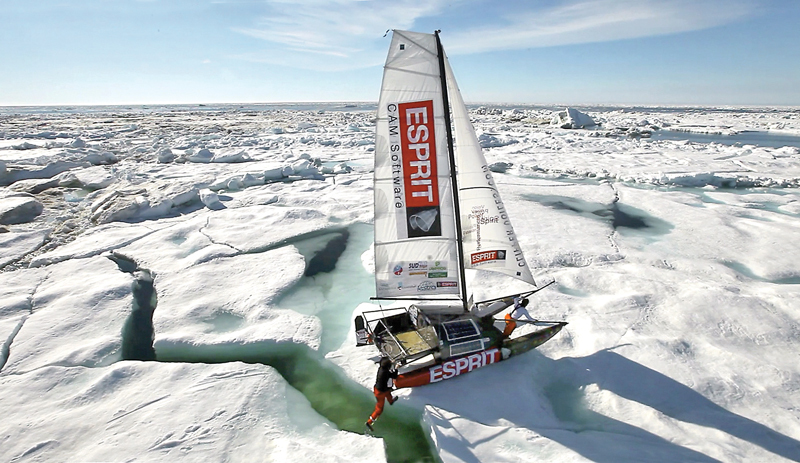 This year, Frenchman Sébastien Roubinet and two crew plan to sail a hybrid iceboat/sailboat 1,620 nm from Alaska to Spitsbergen, stopping to visit Santa Claus along the way. 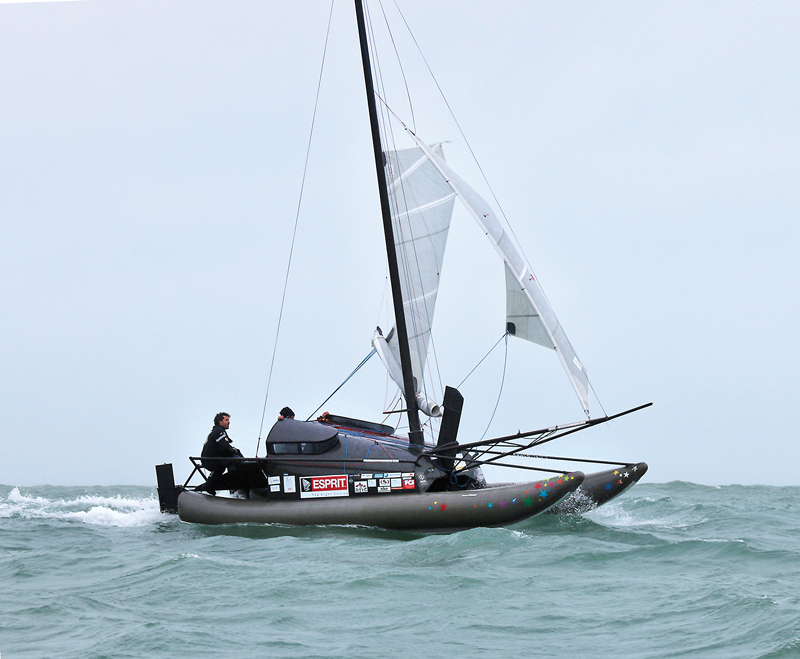 French composites company Resoltech has provided materials for the several iterations of the boat, called Babouche (after the Moroccan heelless slipper). During trials, the first, measuring 24‘9“ x 16‘10“ (7.5m x 5.1m), was deemed too heavy, so a 16‘ (4.9m) version was tested on James Bay, and then, in 2011, an 18‘ (5.5m) version sailed for 45 days in Alaska. Employing basalt fibers, Innegra (a lightweight high-performance olefin fiber; www.innegratech.com), and Resoltech’s “flexible epoxy system” R1600/1606 helped reduce the weight of the third one—a 20‘ (6.1m) prototype—to just 330 lbs (150 kg). That served as a platform for Roubinet to gain experience over two months on the Arctic Ocean, prompting a redesign: Babouche 2 is 22‘11“ (7.0m) long and 7‘10“ (2.4m) wide. Sail area is 484 sq ft (45m2); off the wind it expands to 914 sq ft (85m2). Weight is 440 lbs (193 kg). For sailing on ice, the boat rides on two slides made of carbon/Innegra/basalt, and Resoltech 1020, engineered for flexibility and elongation. The skins of the pneumatic hulls were laminated with Innegra and basalt fibers, using 1600/1606 epoxy. The hulls must be able to withstand significant impacts as they bounce over cracks and sharp ice features, as well as changes in inflation pressure. 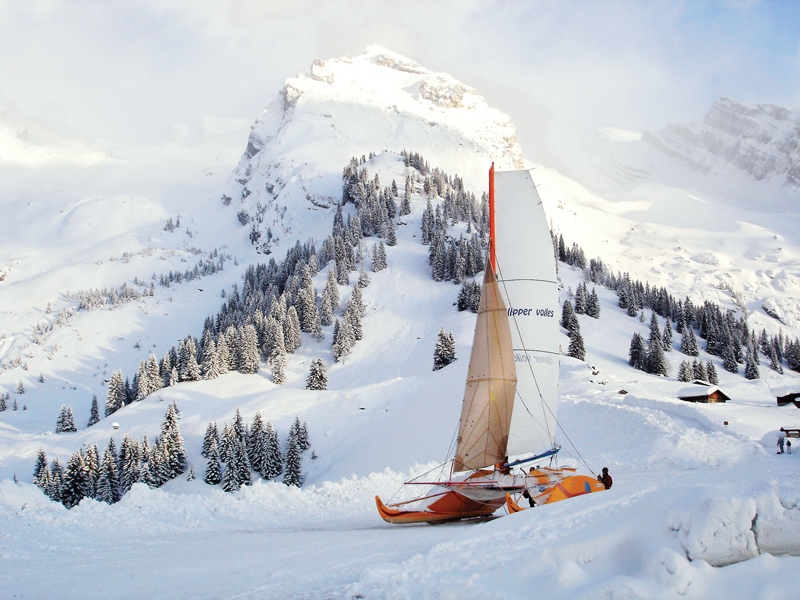 One of three prototypes Roubinet developed as he optimized his ideas for an iceboat/catamaran hybrid is shown here sailing on snow. According to the company’s published lab results, the blend of its 1050 and 1600 systems can set elongation between 4.5% and 80%. The samples were post-cured at 240°F (116°C) for 16 hours, though cure at room temperature is possible. Also, by altering the ratio of one epoxy to the other, hardness, modulus, and strength can be similarly adjusted over a considerable range. The current version, with composite hulls made from Innegra, basalt fibers, and a combination of two Resoltech resins, sails on water and ice. Roubinet wrote to us: “The North Pole expedition will leave Prudhoe Bay June 15 for two or three months, to include Alaska, Pole of Inaccessibility, Magnetic Pole, and Geographic Pole. Arrival is planned in Spitsbergen. During the expedition we are going to make numerous ice thickness measurements and take samples for pollutants and microplastics. My crew includes two others: Eric André, who accompanied me for the Northwest Passage, is a highlander, living in Sweden for the last 15 years, and is currently finishing a family round-the-world trip on bicycles; and Vincent Colliard.” The latter has a long list of successful Arctic adventures over the last 10 years. Resoltech manufactures a wide variety of advanced resin systems, including laminating, casting, prepregs, clear coats, injection molding, and infusion, as well as reinforcements and other composite materials. Resoltech, 249 Avenue Gaston Imbert Zi de Rousset, Rousset 13790, France; tel. +33 (0) 4 42 95 01 95, website www.resoltech.com.